Can I Change the Color of my Hardwood Floors? Many homeowners are delighted to hear that the answer is “yes, you can” to this question. The variety of hardwood options available to you depends on the floor in your home. Lighter woods such as pine, oak, and maple can be stained a wider array of colors. The natural color of the wood is the lightest you can go without bleaching or whitewashing your floors. There is a process of course. There’s always a process. In order to recolor your hardwood floors, you’ll need to sand them before refinishing them. Using a glaze is an easier alternative to refinishing but should only be done if the sanding/refinishing process is simply not possible for you. To apply a glaze, you’ll skip the sanding and simply run a buffer over the floor to prepare it. This process is called “screening.” The resulting color is more difficult to predict because it will be a mixture of the glaze and the already-present stain. It also doesn’t last nearly as long as a proper refinish, peeling off after a while and leaving ugly marks in its wake. Sanding the floor takes off the existing stain and finish, giving you the natural wood to work with. Sanding also gives a perfectly smooth surface that can propely accept the later applications of polyurethane and maybe a stain. A stain will allow you to darken the color of the wood to exactly what you want. After the stain, apply water or oil-based pol;yurethane to refinish your hardwood floors. Check out my article on which poly may be best for your situation here. How light or dark you decide to go with this process is entirely up to you. 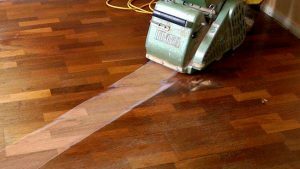 It’s poissible to stain your floors as dark as you want to go, or perhaps whitewash your floors to get them lighter than their natural color. What you decide to do depends on the rest of your decor and what you’re feeling, but the moral of the story is that with the right supplies and professionals, your hardwood floor can be as light or dark as you want it to be! Company Spotlight: Mohawk Flooring - Monet Floors on Carpet or Hardwood?